The term "sport shirt" describes any of several styles of shirt originally designed and worn for sporting pursuits, but in the early 2000s are incorporated into the broader category of informal or leisure wear. 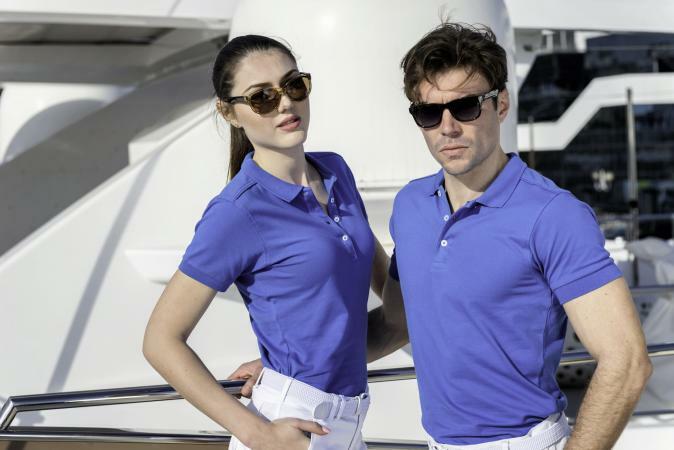 Examples include polo shirts, rugby shirts, and short-sleeved shirts cut similarly to business shirts but in less formal fabrics and colors, and with collars designed to be worn open. It is almost impossible to discuss a man's wardrobe without mentioning the importance of sportswear in providing some of its key silhouettes throughout recent history. With the decline (and in some places the actual demise) of the suit in the workplace, and by default the shirt and tie, and the rise of "dress down," or business casual, men have looked to the clothing they wear in their leisure time as the basis for both adherence to sartorial standards and the display of individual taste. For many, regardless of sporting intention or not, these items tend to have either a sporting association (possibly by celebrity endorsement) or have a dual purpose as sports and casual dress item. Sport shirts play a vital role in the dress-down wardrobe. They are readily available, accessible price-wise, and require little thought when being coordinated with other items. The polo shirt is a classic example of sportswear filtering through to the mainstream as a fashion staple. Designed for the rigours of the polo pitch during the nineteenth century, the polo shirt was later adapted for the tennis court. The tennis version designed during the 1930s by René Lacoste was welcomed with enthusiasm by the rich and famous on the French Riviera. With the rise of the leisure-wear market during the 1970s (when many men broke with the tradition of wearing a shirt and tie both during the week as well as on the weekend), the polo shirt was adopted into the working wardrobe and was also worn with jeans or unstructured slacks for leisure time. This marked the advent of an era when men and women began to put comfort first as a criterion for choosing their clothing. Although Lacoste pioneered the sports-shirt look, Adidas, Fred Perry, Ben Sherman, and (in particular) Ralph Lauren championed the look from the 1980s onward. During this period, its popularity coincided with rise of style tribes such as the mods, casuals, B-boys, and skins. Each group incorporated a particular manufacturer's version to create its individual look. During the same period, the generally small and inconspicuous monograms that had been tastefully embroidered on many of these shirts (Lacoste's crocodile, Lauren's polo player) were imitated and enlarged by rival companies (Henry Cotton used a fly fisherman, Fiorucci a triangle). Logos and branding came to be an integral part of the look of some polo shirts, rugby shirts, and other leisure wear. The look would be picked up and exploited by many designers and brands, including Tommy Hilfiger, Chipie, Nike, Benetton, and Diesel. The rugby shirt, like the polo shirt, originated in a jersey garment worn for a particular sport. The standard rugby shirt, with a knit collar and broad stripes (originally in team colors) moved off the playing field and into the leisure wardrobe in the mid-twentieth century and has remained a staple item of male casual dress. The American men's outfitter Brooks Brothers was instrumental in developing sports shirts derived from the white shirt that had become standard business wear in the early twentieth century. The company introduced madras cotton shirts (in bright stripes and plaids) in the 1920s, cut similarly to business shirts (though looserfitting) but intended to be worn without a necktie. And at least according to legend, John Brooks, president of Brooks Brothers, noticed at a polo match in England that the players had their collars pinned down in order to stop them flapping in the wind. Taking this idea back to America, he developed it into the Brooks trademark button-down collar shirt. Originally intended to be worn, like the polo shirt, as a sports shirt (that is, without a tie and with its top button unbuttoned), the button-down collared shirt was adopted in the 1950s as part of the Ivy League look, worn with a tie, sports jacket, and casual slacks; it is a look that has endured. See also Polo Shirt; Sports Jacket. Barnes, Richard. Mods! London: Plexus Publishing Limited, 1979.